How do I remove boot choices that I no longer want? - Ask Leo! In Windows XP removing boot choices is as simple as editing a hidden configuration file. Fortunately finding that file is relatively easy. Is there a way to remove that choose and all the other installation files from Windows Media Center? I’ve already formatted the second partition. It sounds like you’ve already gotten rid of the installation files by reformatting, so all that’s really left is getting rid of your boot choice. If the installer worked as I expect it did, it should be easy to fix. There’s a hidden file in the root of your boot drive that not many people know about, called “boot.ini”. It controls what happens at boot time. In the past the thing to do was to edit this file manually, but that’s no longer necessary. In this example, you can see that I have two options to choose from when I boot: Windows XP, and the Recovery Console. I’m guessing you have an additional line for the XP Pro Setup that you had trouble with it. You can simply delete that line. And if you’re tired of having the computer wait 30 seconds for you to choose an operating system, you can also change the timeout value, as I have in my example. Save that file, and when you next reboot you should no longer have that additional option. Fixing Windows 7 Boot Problems - Your Windows 7 Setup disc can help you repair many types of boot problems. My computer locks up and won’t boot. What do I do? - There are a few things to take a look at with your system if your computer locks up and won't boot. My Machine Won’t Boot, How Do I Get at Its Files? - If your machine won't boot for some reason, there are a couple of approaches to try to get the data off its hard drive. How Do I Reformat and Reinstall Windows? - To reformat and reinstall is considered the "nuclear option" when it comes to dealing with Windows problems (or just cleaning up). « Previous post: Can I prevent my mail from being forwarded by others? I went to the windows 2000 and can’t seem to locate the boot.inf file. It has windows 2000 on it and a partially installed xp pro, that went bad. Is it safe to delete the windows folder on C drive? I am not familiar with 2k os, so I need more detailed information on it. I did a search and the computer comes back no such file. Can it be named something else in windows 2k. That’s boot.ini, not inf. And it’s typically a hidden file at the root of your hard disk. I have a similar problem to the one described above, except that I am using a pc with Windows ME installed. I recently tried an upgrade to XP on a seperate partition, but after removing XP, I still get the choice of which operating system at boot. There is no boot.ini file anywhere on the pc. Is there another way to edit the choices and remove XP so that it automatically starts in ME? i have microsoft media edition 2002. how do i find the hidden files that contain web sites visited and copies of email that have been deleted? that really helped. Thank you very much. I tried your recipe. I printed a hard copy and followed the steps very faithfully. It worked partially. I had two entries on the original .ini file and removed one I don’t want. However at boot time, the removed one appears in a different name, just “Windows”. It continues to do the same thing before, i.e. to install my XP pro again. Any further suggestions? I know I can get rid of this problem with a clean re-install of my XP, with reforming the selected hard drive. It just does not appeal to me. I want to thank you for being there. Your advice on how to simply remove a boot choice was perfect. I had done it many times before but had to go through a convoluted effort and your pointing out a much simpler method deserves validation. Thank you. THANKS SO MUCH. Did exactly what i needed. I took away the extra line of code and it booted right up. Thanks! There’s an easier way to do this. Start>Run>type MSCONFIG>select BOOT.ini tab>Second operating system should be listed there. Select it and press “check all boot paths” it will say it’s invalid if you have already formatted or deleted the windows files on that drive. It will give you the option to remove it. thankz a lot LEO..u R our best professor for solving our PC problems..more good health to U and GOD bless.. Thanks Leo! It really worked like a magic which was otherwise an annoying problem. your advice on removing multiple os choices at boot was invaluabe. thanks. thants for the info…worry free now..
Leo your are like a good to me. Thank you very very very much. I literally wasted 8 hours today just scratching my brain and trying to figure out how to remove that extra like of code. Tried everything from FIXMBR to FIXBOOT , but nothing worked. And your solution was the most simple and it took me only 30 secs to fix this issue on my laptop, thank you once again. And may god bless you. I booted from a winXP pro install CD, which doesn’t include a partition tool (I thought it did) on my one partition laptop (with windows XP on it). Setup files were copied successfully but it showed an error in the setup process and I had to shutdown. When I restart my computer, I got 2 boot choices, one is my win xp, the other is the win xp setup, which I don’t want anymore. I delete the second line from the boot.ini and on the start up and recovery wizard it shows only one choice. But when I start my computer, there are still 2 choices, and one of them is changed to “windows xp (default)” from “windows xp setup”. I haven’t made a copy of the original boot.ini. What to do now to delete all the setup files and the second boot choice? Thank you! It is so effective method. I have a problem which (I think) wasn’t covered by the article or the ather comments. I installed Vista on a computer that had win XP. Before installing, the boot menu had two entries: Win XP, and Win XP Setup. I thought that instaling Vista will give give the choice to format the disk, but no. The old windows was moved to a windows.old folder, and the boot menu now had three entries – entry nr. 2 is now the Vista. I premeturly deleted the windows.old folder which means the old Boot.ini is gone. Using a boot manager i can only see the vista entry and the XP entry, but not the XP-setup entry. I removed the XP entry. the situation now is that I have two entries: 1.Vista and 2.XP-setup which I can’t remove, and which is always the default entry. I hope you can understand the complication. Any idea how I can solve this mess? My problem is similar to Amit’s. I installed Vista Pro and subsequently erased it. However, the boot entry remains. BCEdit is needed, apparently, to manage the boot entry for Vista. Is there a way to remove this through XP? I have two HDD’s, my main one has Windows XP and my second one i had just installed the Windows 7 Beta on, that didnt work for some reason and now i want tot take out the second old HDD but i want to get rid of the boot choices between the “earlier version of windows” and “Windows 7” so it will automatically boot up with XP which is the earlier version but when i try all the tricks and ways to remove such an option, nothing seems to work. I just want my old auto boot to XP back and no fault windows 7 beta option. I tried looking into it this way but im not sure it’ll help, what should i do? so which ones the invalid entry? it’s not letting me do very much and my BOOT.INI basically looks like the example above. I am sorry this article is not useful for me. Because I have different problem. That I already deleted the XP by formating and installed VISAT but still giving option for XP during boot. Whwn I reinstalled VISAT giving three option XP and two VISAt where one can ionly boot. Bur t westing time and loking bad. I read that article carefully but that is only working with XP not with Vista. Please help me. yep still missing something, i installed windows 7 beta also after original xp pro install. my boot.ini shows only xp pro but when starting up pc, windows 7 (uninstalled and partition it was installed on removed) is still default option…obviusly can’t start up unless manually change to xp each time. You should be able to fix all this. Instead of going to “My computer”, because all the Operating Systems will be different, go to your boot drive (C:) and get into “tools”, “folder Options”, in the “View” tab, change the settings to “Show hidden files and folders”, and also untick the box which says “Hide protected operating system files (recommended)”. Then boot.ini should show up in the C: root. get into it and remove the unwanted OS. I had these same exact 2 boot listings and I removed the Windows XP Pro setup boot just as you said to do but upon reboot it is now repleced with a Windows default boot along with my Windows XP Pro boot but I can’t find the Windows default boot listed anywhere. I looked in msconfig and in my computer/properties/advanced/settings/edit too. How to Uninstall and Remove Windows 7 or Vista Leaving Windows XP on Dual Boot System. I installed Windows XP Pro and then again in another partition installed Widows Vista in the same hard drive with four partitions. Now, is there a way out so that I can completely get rid of that useless “Windows Default” option from the boot option and because there is only one OS installed now which is XP Pro, and it boots my Windows XP Pro normally without any options? hey dude i have a really annoying problem ….! i’m dual booting vista and xp …. I am using VISTA 64, recently i tried to install Linux ASUS 10.1 OS. In the middle of the installation when it ask me to format partition i refused it and quit the installation. now every time i reboot my pc it prompt me in dual boot option with ASUS (windows installer). i found some helpful solutions. Thanks Loe, Its been a pain in the neck for months. Too bad i found your post late. I am using XP Professional and the first hard Disk which contains the primary partition broke now but I was already using the first one before that which already contains a partition now when I removed the Broken one I am still getting those two options. I could have reduced the time to get rid of it but its by default is selecting the broken one. i made the mistake of of changing time to display to “0” and “0” and now i can’t boot up. do i have any hope withhout the recovery cd. please help me! You could simplify even further this “safely” without going through the boot.ini modification, by selecting the desired operating system, under the “Desired Operating System:”, and reduce the “Time to display list of operating systems:” to zero. Voila, startup problem solved. Same goes for System 7! Help! I am not a computer geek and don’t know what to do. Any instructions would be appreciated although you must know I don’t too much about pc’s. Gateway Laptop with Vista Home Prem. upgraded from xp home. 2ghz,2gig ram, 120gb, model mx6447. i’ve got the same problem as Sher who posted above about the “edit boot option” error messgs. except i got these problems. #1: i’ve tried formatting and reinstalling vista home prem. to original factory 2 times. also, i’ve tried restore cd from the gateway restore cd too and that didn’t help. i can still boot to desktop though after setting up from vista cd. #2: i also keep getting the boot option dialogue box during boot. like Sher’s post above. it gets annoying. how do i turn that off so it wont display the boot options dialogue box during boot up. but befor O.S choices. im not talking about the Operating System boot selection. #3: sometimes when i choose to go into the bios setting from setup option in the boot option dialogue box, it will take me to bios setting screen and beep. (forgot how many times)and the dialogue box saying “save configuration settings and restart, yes or no” ..something like that. it keeps popping up so much it take a while for me to click on No and tab over to the default setting. #4: When im on desktop or online using internet explorer my window would restor down and restor up repeatedly on its own. even when i click on the maximize box. also, the menu bar and tool bar i believe thats what its call gets hidden when it does this. so i would have to hover to the very top to make it reappear. but my windows still does the restore up and down non-stop until i close it. or sometime it stop for a while and then starts over again. it gets so annoying i cant even surf the web. #5: damn keyboard is not working can’t type. i notice sometime when im in explorer window where there’s a search box the comma (,) repeatedly types by itself across like the comma key is stuck pressed down. i can’t even backspace but if i press the comma key then it stop typing commas. and when i press very hard on some keys it take a very long time to show up. please help us out i don’t know if Sher has exact problem as mine, but it sound like it. i think all of my 5 problems is related to each other that is why i am having so much problem with this Gateway laptop. help me before its too late, because i am very frustrated and on the edge of dumping it for a new laptop. A Very Thank You and Apreciation from us Dummy in advance. thank you. This worked – for ending the boot selection for me… though one has to manually enter the boot id for the delete operation in CMD panel. My situation is Vista on Drive 0 (c:), Windows 7 on Drive 1 (d:). Thanks to this article, I no longer get the option, but rather boot directly to W7. Fyi I purposely installed W7 as a dual-boot, just in case. i have followed this topic steps every thing iok i’ve getride of the unwanted boot choice looking fordward for yuor experince. i did as u said but now i get windows deafult option at startup??? Hello, Very interresting info BUT my case seams a bit different. I had a dual boot XP and VISTA onto different HDs. The Vista hdd did crash totally. I had no problem to run XP as I had the choice between XP and Vista at boot time.So I installed a new HD with clean partition, active, …Now I am ready to reinstall Vista . My question what to do to get rid of the selection XP-Vista and allow the boot using the Vista installation CD? Actually i do not know what to do.. I have the same boot choices problem, but I have vista. I followed your steps, but mine does not give me an edit option. Any thoughts? i install xp with flashdisk before, unfotunately after install i cant get in to xp, i dunno why. after i test install xp again but now wtih dvdrom. and i see 2 option boot microsoft xp, one can get in, other cannot. its annoying every time boot must choose. I have windows vista and windows XP in partition drives.After windows vista i installed windows XPin different drive.Now window XP loading default there is no option for dual boot.I required to remove XP and i need my previous vista.I tried every way.but i can’t,Please suggest me. I have a similiar problem with XP. When I turn on my computer it gives me choices to start up both saying Windows (default) and counts down from 28 seconds. No matter which one I choose it still works, but its annoying. I have gone in and edit the “System Start-up” section to what you is default, but I dont have a choice on the “Default Operating System” drop down box. Actually, nothing is there at all. I did at one point install Style XP and fixed that issue, but this one I just want gone. Perfect! and it’s the year 2010! I have a system error message stating that the following file is missing or corrupt. windowssystem32configsystem. I used the setup disk that I have like they tell me too and it asked what windows installation do i want to log onto… It seems I have more than one windows on my computer. I don’t know what to do now… help…..
guysss, mine is triple boot: xp, vista and win7. 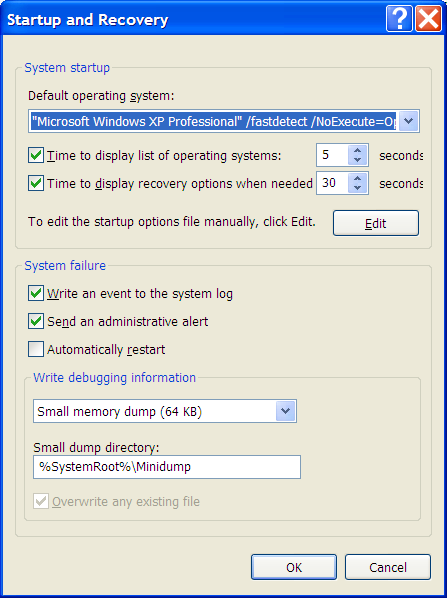 for win 7 you must follow the same steps, but when you reach startup and recovery all you have to do is uncheck the box which says “Time to display list of operating systems” this should fix you boot option problem. Can you pls help me! And One More Thing I m going to do dis using Win 7! In Windows 7 and Vista, instead of clicking on the Advanced tab, click “Advanced System Settings” in the left hand column and then click on the Advanced tab, after that, click on “Settings” under “Startup and Recovery”. Since there is no longer an option to edit the boot.ini, clicking on “Time to display list of operating systems” checkbox to remove the check mark should cause the computer to boot up without giving a choice of boot options. I have Windows XP Professional. When I boot up the startup choice defaults to Windows instead of Windows XP Professional, then it goes to a setup menu. I escape this and restart to manually select Windows XP Professional. How do I get rid of the Windows Setup default forever? really cool dude and very helpful could you also come and solve our problems here in Greece ? i have windows 7 bt when i go to advanced system settings,,,,there comes no option to edit the list of operating system manually,,,,,so how it can be done in this case. I opened the file but it only shows the one option for the operating system I am running, and yet I see the options for Windows 7 when I start my computer. Can you help me with that please? Thank you so much dear sir. It helps me a lot with my boss’s notebook. i have windows xp and windows 7 installed in different partitions of the HD. recently, i formatted the drive where i installed windows 7 and it is the default os. my problem is how do i remove that windows 7 choice when i boot, when all i see in the boot ini file is this. i dont get it. please help. many thanks in advance. For some reason, XP setup leaves a false second boot choice. This note saved me at least a couple of hours of trial and error and with nine PCs due off the bench tomorrow, I needed that time. Thanks! i have 2 OS in my PC one is Windows XP and Secound is Windows & ultimate, However suddenly i just dot get that select OS menu and its start with the Windows XP. now what to do for bring bank that option and Run Win. 7 ? Just use msconfig. windows key + r then type msconfig. There is a tab labeled boot, and the boot choices are listed there, with the current OS labeled. Delete the choices you no longer use. Missing operating system is often because it’s trying to boot from something other than the internal hard drive. Try disconnecting USB drives (and removing any floppy disks … ha! … if this is a very old machine. 🙂 ). Floppy disks? 🙂 This is 2016. I asked my university students this week if they’ve ever used a floppy disk, and it turned out that none of tham had ever used a floppy in their lives. 1. Right click on the My Computer icon on your Desktop. 2. Select (left click) Properties. 3. Select (left click) Advance tab. 4. Look for ‘Startup and Recovery’. 6. Click on the ‘Edit’ button. Notepad will pop up. 8. Copy the line ‘multi(0) …’ which mentions the operating system of your choice. (If you feel uncomfordable with these instructions LEAVE NOW and call a professional). 9. Paste the copy under the copied line. 10. Shorten or change what is between “” to “Whatever”. 11. Close and save or save and close the Notepad. 12. Look for ‘Default operating systems:’. 13. I’ll skip this number. 14. Click on the down arrow and choose “Whatever”. 17. Now you have ” Whatever” as default in your boot menu. Your computer will automatically boot in n amount of seconds to “Whatever” operating system. 18. Go to 1. again to get back to the Startup and Recovery dialogue box. Now you know what to do to change the amount of seconds untill your computer boots into the Default operating system. You will notice that the annoying default choice has dissapeared along our process of making changes.